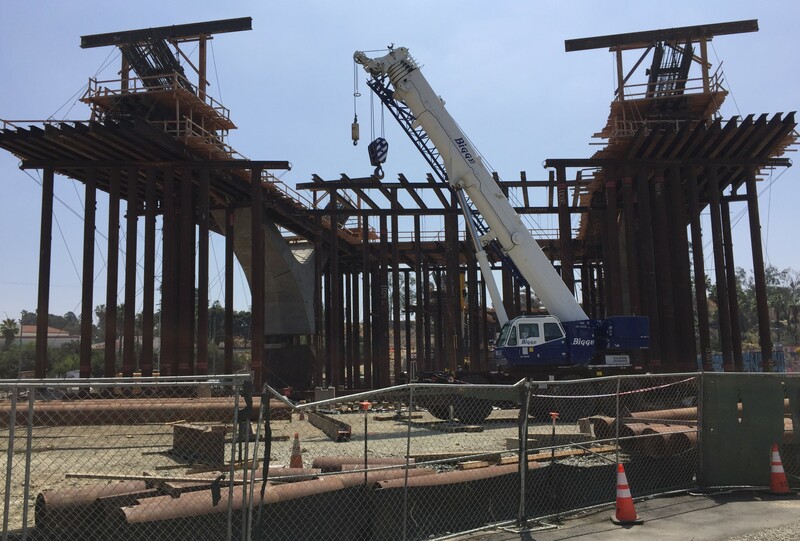 Construction proceeding on the new 6th Street Viaduct. 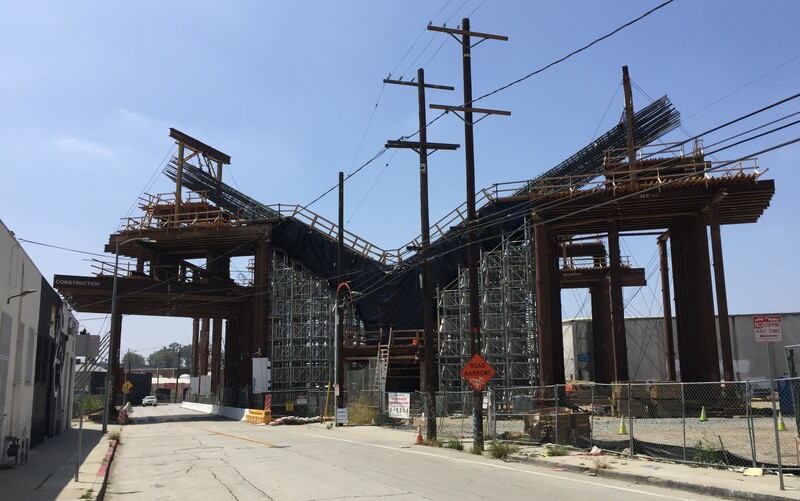 All photos by Joe Linton/Streetsblog L.A.
Construction is proceeding on L.A. City’s $482 million Sixth Street Viaduct. The historic 1932 viaduct was demolished over the course of several months in 2016. The new bridge is now anticipated to open in 2020. 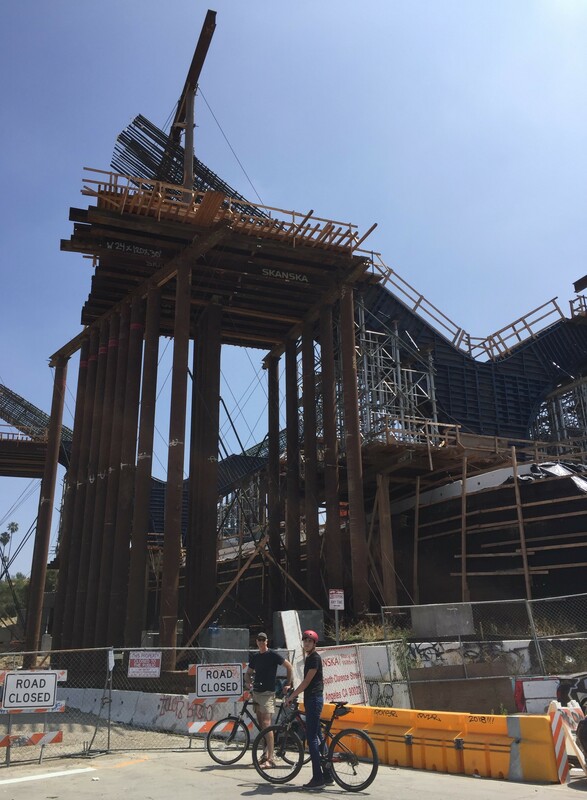 The new landmarkbridge will extend nearly a mile – all the way from Boyle Heights, over the Los Angeles River, and into downtown Los Angeles. It will include ample space for cars and pedestrians. Where cyclists are expected to fit as yet remains unclear. Protected bike lanes were promised in the original documents, but have yet to make a formal appearance in a rendering, model, or budget. The design – by architect Michael Maltzan – features a series of massive arches. To get a sense for the project, watch this fly-through video. On either side of the river underneath the new structure, there will be a new park, performance, sports, and play spaces. The new arches have not been built yet, but their Y-shaped bases are visible today, especially east of the river. 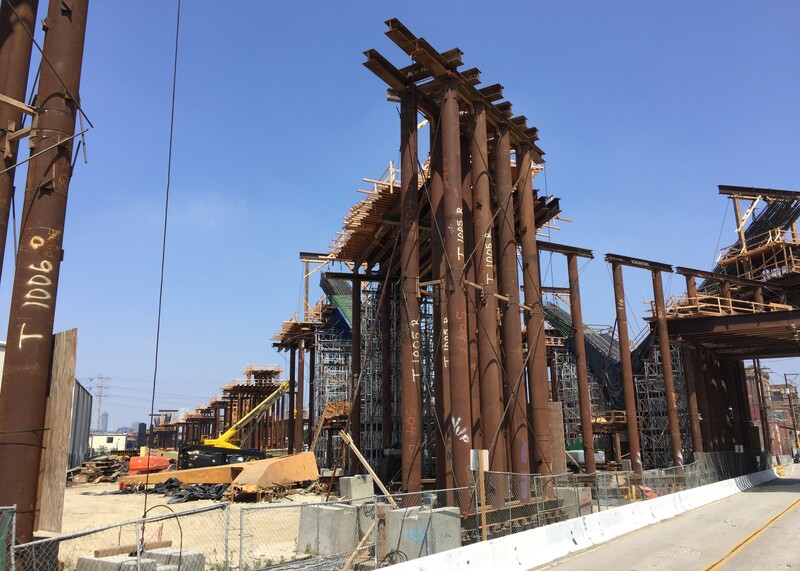 Construction appears to be furthest along near the 101 Freeway, with very little visible construction on the downtown end, west of the river. 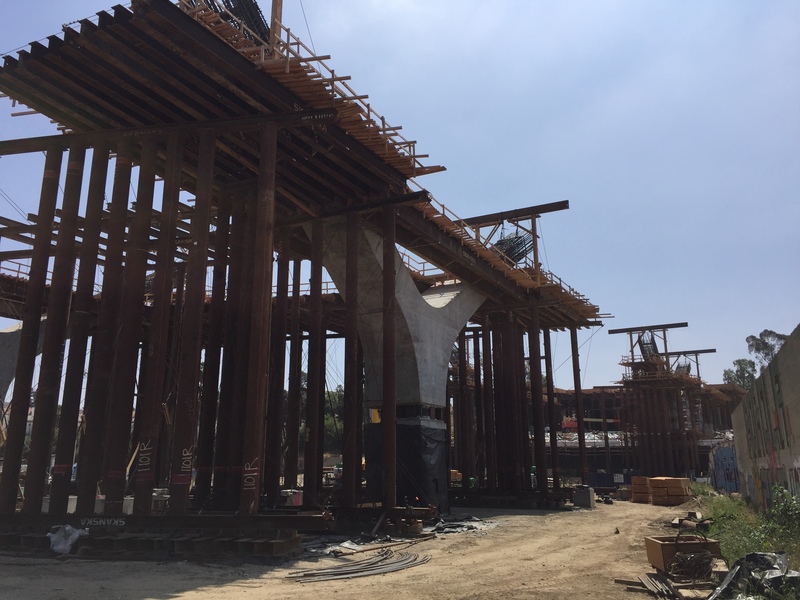 Another Y-shaped base for the Sixth Street Viaduct. This was one of only a couple Ys where the mold had been removed and the concrete was showing. 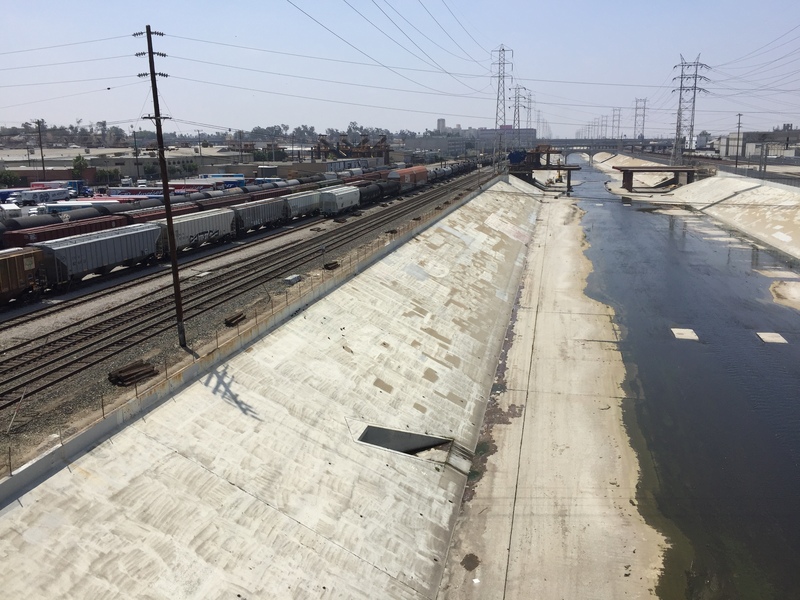 View of Sixth Street Viaduct construction from the Fourth Street Bridge. So far, the work at the river itself appears to be mostly platforms to support construction above. Note Y-shaped arch base structures visible to the left. 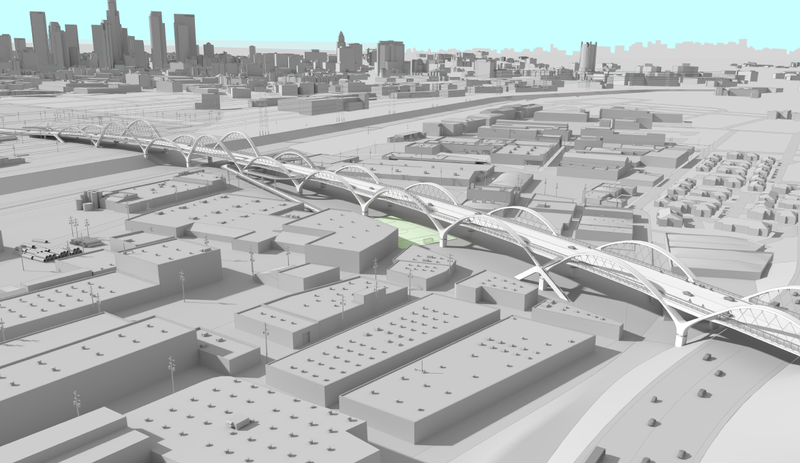 For more information on the Sixth Street Viaduct, see earlier SBLA coverage or the city’s project website. Has anyone at Streetsblog been in touch with anyone working on the viaduct to get an answer on the protected bike lanes? It would be a massively big miss, and a very unforgivable one, if they weren’t included. It’s amazing people will graffiti tag even temporary structures……. I had asked about it for years, as the linked article describes. And the only answers I was able to get were that it would be expensive to put a concrete barrier between cyclists and the travel lanes. It was stunning to me that on the biggest project in the city’s portfolio – nearly a half billion dollars – and one that they were touting as both a destination and the future of mobility, they would leave that out. The last I heard was that the barriers would likely be plastic, which I would have thought would have been seen to cheapen a project they spent so much time designing to be sleek… but I was unable to ever get a concrete answer from either the LACBC or the 6th St Viaduct project people or anyone else. Protected bike lanes were promised in the original documents, but have yet to make a formal appearance in a rendering, model, or budget. Read my comment on the earlier articles on the topic, this is explained in greater detail. But basically, it looks like they’re putting in a wide sidewalk, not actual separated bikeways. Or, alternatively you could read the linked articles where I go into this in some depth. Long story short…there is a bicycle lane striped in the latest flyover video. And the massive model itself shows cyclists are intended to be on the road. That hasn’t changed in a few years and that has been the position of everyone I’ve spoken to. But how those cyclists will be protected remains incredibly vague. It would make the most sense to have the bikes alongside the pedestrians so that they could get down to the park areas via the ramps. It would seem so…but that would put them in conflict with the families and small kids on bikes the city hopes the bridge brings. Yet, I’ve seen no way for bikes on the roadway to get to the promenade area, either. Frankly, the amount of thought given to how bikes would access and move through all this new infrastructure appears to have been astonishingly limited. CicLAvia returned to central Los Angeles neighborhoods including Chinatown, Boyle Heights, Little Tokyo, and downtown L.A.